A combined operation by West Dorset District Council and Dorset County Council has saved recreational space which was due to be sold at Maiden Newton and Cattistock for the villagers. 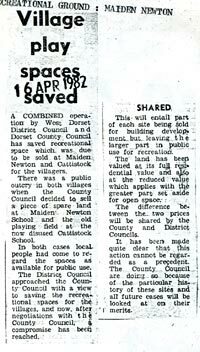 There was a public outcry in both villages when the County Council decided to sell a piece of spare land at Maiden Newton School and the old playing field at the now disused Cattistock School. In both cases local people had come to regard the spaces as available for public use. The District Council approached the County Council with a view to saving the recreational spaces for the villages, and now, after negotiations with the County Council a compromise has been reached. This will entail part of each site being sold for building development but leaving the larger part in public use for recreation. The land has been valued at its full residential value and also at the reduced value which applies with the greater part set aside for open space. The difference between the two prices will be shared by the County and District Councils. It has been made quite clear that this action cannot be regarded as a precedent. The County Council are doing so because of the particular history of these sites and all future cases will be looked at on their merits.